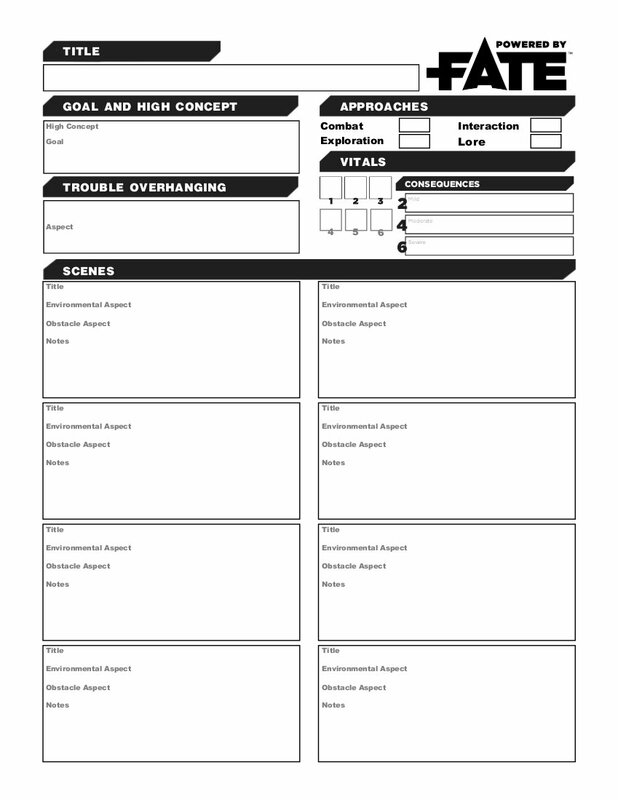 In my previous post I talked about building an adventure for the War of Ashes RPG and I used a sample form I put together for the purpose. A number of people have asked me for a blank version they could use, so here is the 1-page_Adventure_template (PDF.) If you prefer a JPEG version, click on the thumbnail instead. I’ll probably be tinkering with it some more, but it’s good enough to use. Posted on January 14, 2014 by mechanteanemonePosted in games, rpgsTagged adventure, design, FATE, Fate Accelerated, Fate Core, games, how-to, resources, rpgs, scenario, WarOfAshes, writing. Next Next post: Do: Fate of the Flying Temple — Playtest document is in! This is really nice, but would you have a version that is editable? I prefer to do everything electronic if I can to cut down on printing everything. Robert, I don’t exactly, at least not as a form-fillable PDF because I don’t currently have software that would do this cleanly. I do have the Scribus version that I print to PDF and which is editable, and I’m happy to share that. However, although free and really neat, Scribus has a significant learning curve. I’m a very tech savvy guy, so I would be willing to give it a shot. Does Scribus have any other export functions, like to Word or RTF perhaps? Those would be just as good.